The competitive landscape of the Global air conditioning systems market is characterized by the presence of a large number of well established companies such as Daikin Industries Ltd., Gree Electric Appliances, Inc., and Carrier Corporation. As well as the presence of emerging players such as Panasonic Corporation, Mitsubishi Corporation, and The Midea Group. There are also several promising players such as LG Electronics, Haier Electronics Group Co., Ltd., and Hitachi Ltd. Each of these players have been striving to strengthen their position in the air conditioning systems market and achieve sustainable growth. Each of these players arriving to achieve a strong position within the Global air conditioning systems market. According to Transparency Market Research TMR, companies are focusing in densely on integrating their productspoint players are also considering strategic partnerships and acquisitions so as to expand their customer base. According to TMR, the global air conditioning systems market will be worth US$167 bn by 2024. On the basis of type of air conditioning systems, split AC is witnessing highest demand. However fastest growth rate is to be expected by the portable air conditioning systems. On the basis of Geography, the Middle East and Africa is witnessing the fastest growth rate whereas Asia-Pacific is leading in the market both in terms of value and volume. On the basis of application area, it is the commercial segment which has been living in the market and is expected to continue to do so throughout the forecast period on account of the use of air conditioning systems in hotels, hospitals, clinics, and similar other areas. In terms of volume however, the residential application segment LED in the past. Residential segment is also anticipated to witness the fastest growth rate during the forecast period. According to the lead author of this report, the growth of the global air conditioning systems market is majorly on account of the growing construction and housing sector. This is because, the growth of the construction permits especially commercial infrastructure creates a heightened need for air conditioning systems. 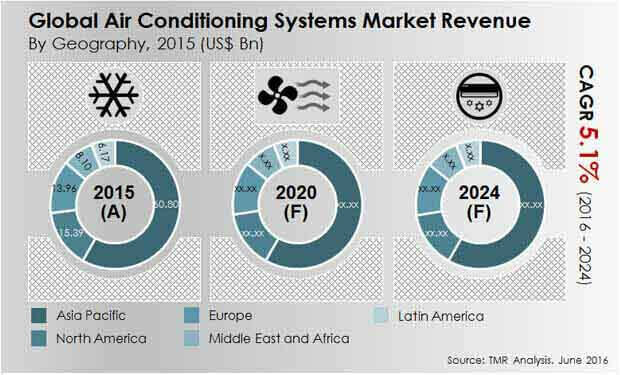 Stringent government regulations and policies, growing consumer expectations and technological advancements are also helping drive the growth of the global air conditioning systems market. The demand for air conditioning systems is very strong from the commercial sector in the Asia Pacific region on account of climatic variations. The growing awareness regarding the need to maintain the quality of air in doors is also leading to an increase in the uptake of air conditioning systems which offers advanced air purifying technology. On the other hand there are a few factors which are expected to him for the growth of the global air conditioning systems market. One of the key factors is the increased energy consumption by these systems. Nevertheless, manufacturers within the global air conditioning systems are adopting green technologies and advanced technologies which are making air conditioning systems energy efficient. Players are also coming up with designs which meet the energy requirements of consumers as well as complies with the government standards. The trend of green technology and smart homes are expected to create several growth opportunities for the global air conditioning systems.